I have some super exciting news!! We are having a HUGE giveaway which is featuring something everybody wants (including me)! A Vitamix Pro 500 64 oz Stainless Steel Variable Speed Blender that's valued at $600. That's exciting right?!! But it gets better. 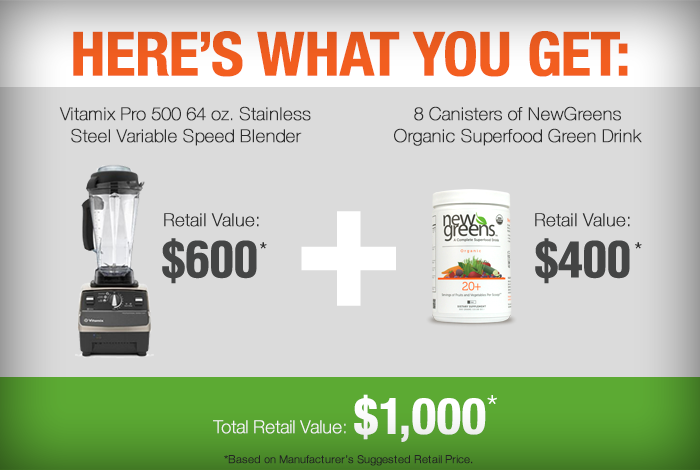 If you win, then you will also receive 8 canisters of NewGreen Organic Drink Mix valued at $400. Yep, that's $1000 worth of products! Pretty fantastic, right? The Vitamix is probably the most wanted kitchen gadget right now. Thanks to it's pulse function and preprogrammed blend settings you can make almost anything! It can blend, puree, chop or mix so you can make soups, frozen desserts, sauces, nut butters and a ton of other delicious goodies. Yum! Yum! Yum! And when you win the giveaway, you can use your new Vitamix to make fabulous smoothies (like these) with the NewGreen Organic drink mix!! This summer you could even sneak in 20+ fruits and veggies into your kid's diet by using NewGreen to make healthy popsicles. They'll never know! But what I absolutely love is that the NewGreen Organic Drink mix is 100% certified organic! It is even full of antioxidants to keep you looking young and beauuutiful!! NewGreen will keep you balanced with its healthy detox agents (like Organic Chlorella powder and Certified Organic Spirulina powder, Organic Turmeric (root) powder and more). Awwwe-some. It's even gluten free and vegan friendly! Seriously, you should read about NewGreen Organic (by clicking on the link) and I think you'll be really impressed with the quality of their products. I want to write down all the fantastic things about this drink mix, but I know you can't wait for the giveaway. If you want to talk about any of the ingredients please leave a comment! I'd love to chit chat. Use Rafflecopter to log your entries and unlock bonus entries. Visit the other bloggers who are participating in the giveaway to finish signing up if you haven't already. They have worked hard to provide this giveaway so send them TLC by visiting their site (trust me-- bloggers love visitors). Detailed terms and conditions are available in the Rafflecopter if you have questions or concerns. Entries will be accepted until May 9, 2014 at midnight. The winner will be randomly selected on May 10 and notified by email. The winner will be announced publicly by May 13. Yay!! I hope that it's you! Good luck! 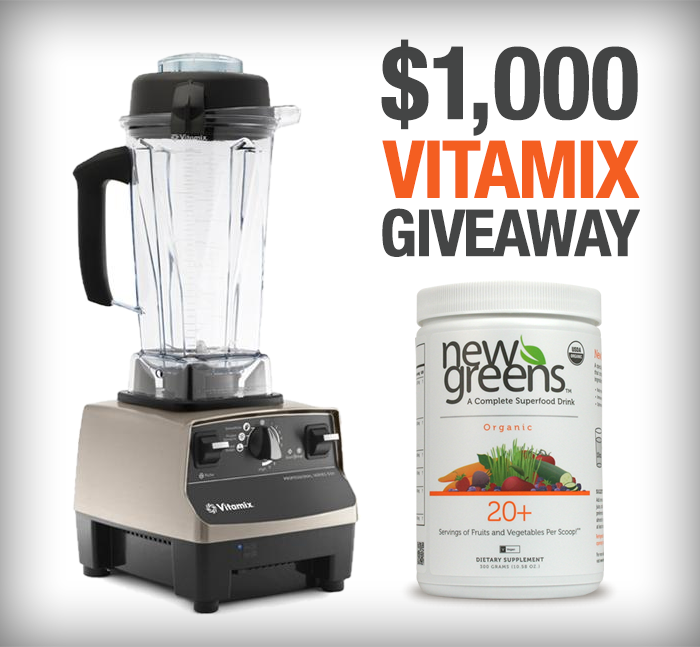 If you won, what would be the first thing that you make with your Vitamix?! Disclaimer: This Giveaway is sponsored by Pure Prescription and I was paid for this post, but that still means that this is totally awesome. And I promise to never spam you. I like you too much.